The kit includes a queen size wall bed and a 25 inch storage unit with one door. The mechanism provides simplified assembly of the Wall Bed. Increased comfort due to Euroslat mattress support system. Simple and safe dual piston system makes opening and closing user-friendly. Easy to use; use the handle to pull the bed towards you to lower the bed and flip the leg down onto the floor. Accommodates a standard queen mattress up to 12 inch thick and weighing at least 70 lbs. The bed when opened will require a clearance of 92.3 inch from the wall extending into the room. Clearance of 9.6 inch under the bed when it is open. Mattress not included. Box spring not required. The 25 inch storage unit has 2 fixed and 3 adjustable shelves to maximize your options. 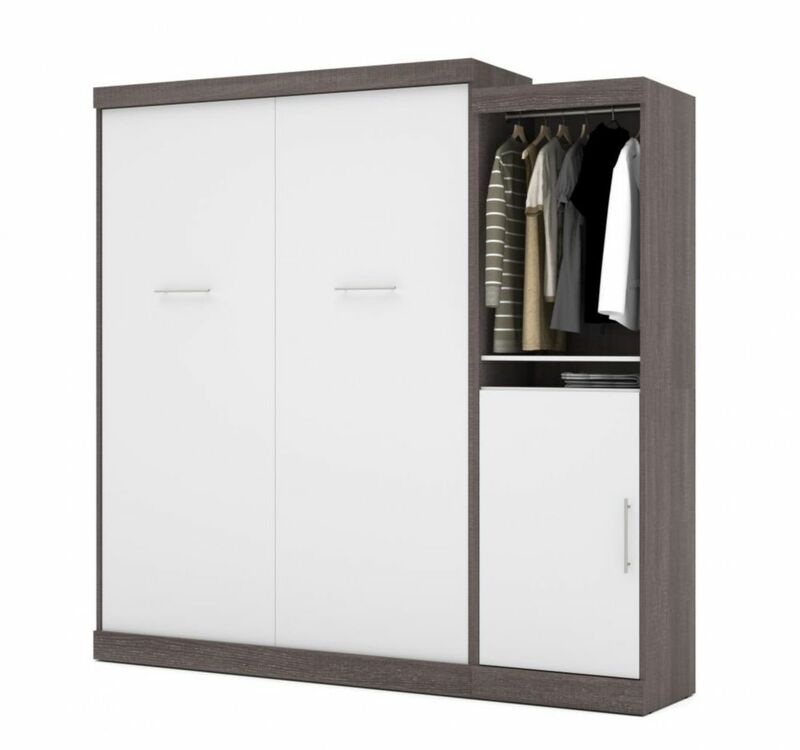 The reversible door provides closed storage on bottom or upper section of the storage unit. 2 clothing rods are also included. Easy to install. Assembly required. This contemporary queen size leather-look upholstered bed frame is the perfect update to any bedroom. With a high headboard and low side rails covered in rich dark brown leather-look material, this stylish bed will complement any decor. The base, anchored by sleek, solid wood feet complete the modern look of this set. Box spring and mattress are not included but they are required. This bed & headboard set is the perfect starting point to create your own perfect modern bedroom set with lots of storage. The high in style Nomad Collection from Nexera combines modern lines to beautiful Natural Maple and white finishes, creating a welcoming and trendy bedroom set. This queen mates bed (60") from the Fusion collection will help you create a trendy and peaceful bedroom. Its minimalist lines and neutral finish allow it to fit in anywhere, adapting perfectly to your dicor and your lifestyle. Its many storage spaces are ideal for keeping your room well organized. Nebula 90 inch Queen Wall bed kit - Bark Gray & White The kit includes a queen size wall bed and a 25 inch storage unit with one door. The mechanism provides simplified assembly of the Wall Bed. Increased comfort due to Euroslat mattress support system. Simple and safe dual piston system makes opening and closing user-friendly. Easy to use; use the handle to pull the bed towards you to lower the bed and flip the leg down onto the floor. Accommodates a standard queen mattress up to 12 inch thick and weighing at least 70 lbs. The bed when opened will require a clearance of 92.3 inch from the wall extending into the room. Clearance of 9.6 inch under the bed when it is open. Mattress not included. Box spring not required. The 25 inch storage unit has 2 fixed and 3 adjustable shelves to maximize your options. The reversible door provides closed storage on bottom or upper section of the storage unit. 2 clothing rods are also included. Easy to install. Assembly required.